To contact a particular department, please refer to the contact details provided in their section of this website. If the department does not have a presence on our website then please refer to our internal telephone directory, or the list of departmental email addresses. Parking: If you wish to park in one of the College's car parks then you must make arrangements prior to arrival as space is very limited. There is a public multi-storey car park in Park Street, adjacent to the College. *Please do not attempt to reach Park Street car park via Magdalene Street - there is a bus lane subject to a Penalty Charge Notice of £60. At junction 33 of the A14, take the A1309 Milton Road south signed 'Cambridge and City Centre'. At a roundabout 1 1/2 miles along, turn left onto Elizabeth Way signed 'Cambridge'. Go straight ahead at the next roundabout, signed 'Station and Cherry Hinton', and cross the river Cam on an obvious modern bridge. At the next roundabout turn right onto Newmarket Road. Go straight ahead at the next roundabout and after 1/2 mile turn onto Jesus Lane signed 'Parking (Short Stay)'. After a further 1/2 mile turn right into Park Street at a set of traffic lights. The car park entrance is 100 meters along Park Street on the left-hand side. From the car park, either walk back along Park Street and turn right into Round Church Street, or take the alley from the back of the car park to Bridge Street. Enter the College through the iron gates to the right of the Chapel and enquire at the Forecourt Porter's Lodge under the arcade at the opposite end of the court. From London, trains to Cambridge leave from both London Kings Cross and London Liverpool Street stations. Refer to the National Rail website for journey planning information. 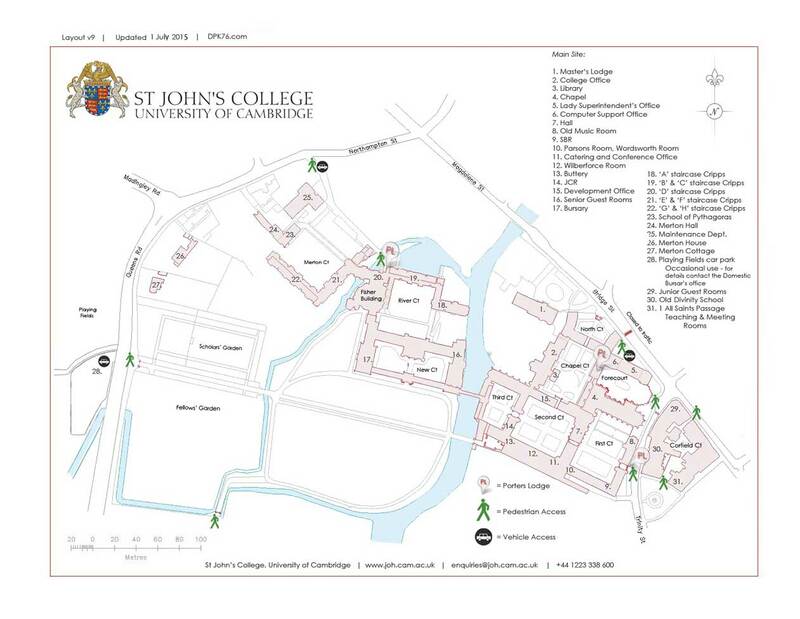 Cambridge station is a 20 minute walk, or a short bus or taxi ride from St John's College. Cambridge operates a convenient 'Park & Ride' service, with five sites around of the city. The Madingley Road and Newmarket Road sites' bus route passes just outside the College, stopping on Bridge Street; the other services stop at central bus station. More information is available on the City Council 's Park& Ride website. Most services terminate at the Cambridge Bus Station. From here make your way towards the centre of town, down St Andrew's Street. At Lloyds Bank, bear left into the pedestrianised city centre, and follow Sidney Street. Follow this road until you see the College Chapel. Turn left opposite the Round Church, enter the College through the iron gates to the right of the Chapel and enquire at the Forecourt Porter's Lodge under the arcade at the opposite end of the court. London Stansted is the most convenient airport, but there are good links to Cambridge from London's Heathrow, Gatwick, Luton and Stansted airports, as well as Birmingham airport. If driving you can plan your route using Google Maps, otherwise refer to the instructions above to plan your onward journey by rail or coach.